The Constitution is the supreme law of Singapore, but have the courts unnecessarily limited their role of upholding the Constitution? This article is based on a speech delivered at an event at the Conrad Centennial Singapore on 4 December 2014 entitled The Role of the Judiciary in the Promotion and Protection of Human Rights organized by the Delegation of the European Union to Singapore to commemorate Human Rights Day. 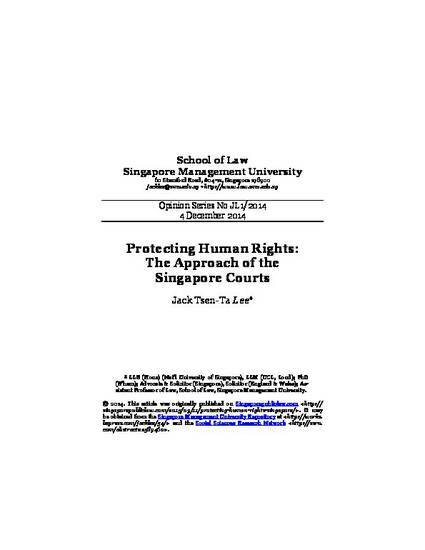 This article was originally published at http://singaporepubliclaw.com/2015/03/11/protecting-human-rights-singapore/. It may be obtained from the Singapore Management University Repository at http://works.bepress.com/jacklee/54/ and the Social Sciences Research Network at http://ssrn.com/abstract=2589460.